One of the NGOs that This Zine Supports is ENOUGH. One of the founders is John Prendergrast who was on the National Security Council during the Clinton Administration. This Week this Group has published a Policy Paper for the incoming Obama Administration regarding African Issues and the various ongoing Conflicts. There is one suggestion to enhance a Peacekeeping Strategy that is so simple that its Brilliant. What is this Great Strategy? In this Paper the Organization calls for the setting up of a Inter-Agency Task Force to deal with the myriad of conflicts that are taking place in Central and East Africa. This Task Force should be under the stewardship of a Senior Member of the State Department or the National Security Council. It will coordinate the Diplomatic Strategies for the Following Conflicts: Sudan,Chad,the DRC,Central African Republic, The Ethiopian-Eritrean Situation, The Somali Fiasco, and the resurgent Lord's Resistance Army. It is Possible that the Situation within Zimbabwe could result in that situation being placed under this Task Force as well. The Task Force could have the capability to share resources,personnell,and intelligence across the region to ensure the maximum cooperation between agencies. Although it is not mentioned directly the question about AFRICOM and its potential role is waiting to be asked. At this time most contact that is made with the United States is done on a Military Level. There are Several Conflicts in Africa that could be seen as a Test for the Incoming Administration. Currently there are three Conflicts that are considered to be the most deadly. 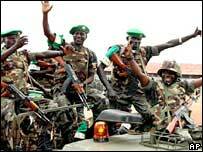 The Eastern Democratic Republic of the Congo which has seen a Spike in Militia Activity. This includes the Poorly Executed Offensive by FARDC (Armed Forces of the Democratic Republic of the Congo,the UPDF (Ugandan Peoples Defense Forces) and the Government of Southern Sudan which has led to a brutal series of reprisals by the LRA. And of Course there is Somalia. Where a Weak Transitional Government has seen its main Power Backer (Ethiopia) withdraw from the Country. A group of Islamist Militias is now fighting amongst themselves to win power. And of course there is Piracy. The Paper feels that Solving the Situation in Sudan should be the major concern. Another Possible Aspect Change could be how the US Speaks about Africa in public statements. This includes those Editorials that will be heard on the African Services of the VOA. The Future is now to solve these conflicts.